Better late than never right? Here are my favourite games of 2012. Before I get to my personal Top 10 Games of the Year, I feel the need to mention some of the titles that had impacted me the last 12 months as well. 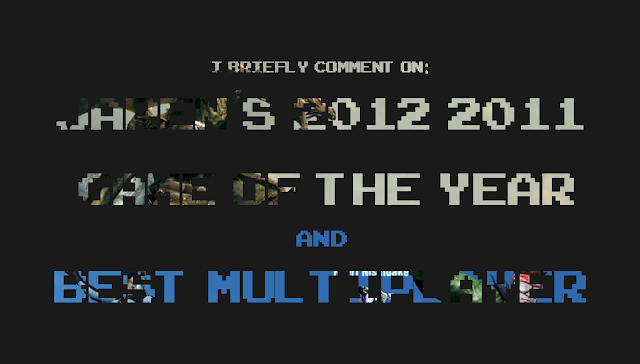 Starting things off are my 2012 2011 Game of the Year and my Best Multiplayer Experience. My 2012 2011 Game of the Year celebrates the best of my backlog, a title that I had finally found the time to invest in and made me regret waiting so long. Best multiplayer on the other hand is more self explanatory. It simply represents the best experience I had with other players. It doesn't hurt that the title made me reconsider what multiplayer actually means as well. If there’s one thing that the gaming community shares, other than the love of the medium, it has to be the backlog. We all have them. Titles that have caught our attention, but we can never find the time to properly give them. 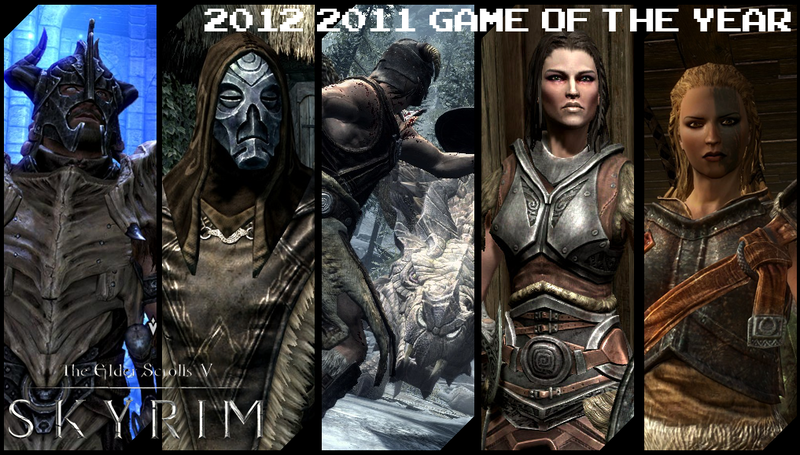 I debated adding Skyrim to my Top 10 Games of 2011 solely based on the critical acclaim it had received and regardless of the fact I had only played three hours prior to having to come up with that list. I know what you're thinking, where is the integrity? Early 2012 however, was dominated by this open world title. Though I did not finish the main story line, I had successfully invested over fifty hours to just exploring the world it had to offer. I fought dragons, I raided dungeons, I found traveling companions, I even made a heck of a lot of Iron daggers and enchanted them. The list goes on. Plus, when one of the game’s side story quest lines takes you longer to complete than a handful of the other games you played that year, you know you have something special. If I had to pick one sentence to describe my Skyrim experience this year, it would have to be the cliché “I should go hang out with my girlfriend… but I want to play more Skyrim”. I hope she doesn’t read this. *Disclaimer: While five of my snowboard designs were selected by EA Sports and/or EA Canada to appear in SSX, the following post does not reflect or influence any sort of bias in favour of the game. Some may find this selection pretty strange. SSX did not launch with synchronous multiplayer, neither split screen or real time online head to head. The latter was actually added to the game over the summer through a downloadable patch. Instead, the game relied on real time leaderboards to in order to build that sense of competition. 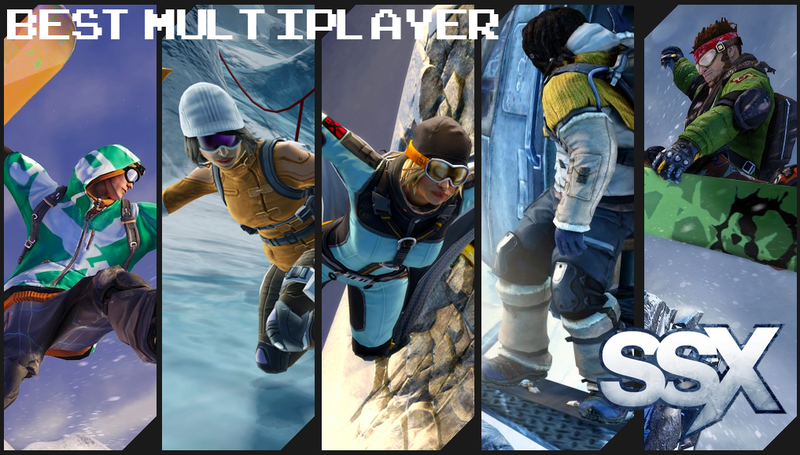 SSX featured two multiplayer modes: Explore and Global Events. The first had you competing in different events and upon completion, your performance would be ranked amongst all the players on your friends list. The second has you competing on a more global scale, with events lasting a certain amount of time and your performance being compared to players all over the world. The game also a single player campaign, but it was mostly just a tutorial for the multiplayer offering. You need friends to properly enjoy the title, and this was the first time I added my online handle to some sort of message board directory in order to find some. There was just something about climbing those personal leader-boards that had me hooked. There were times where I would finish a round and see that I overtook five people on my friends list. While that may seem impressive, the game would proceed to list my friends ahead of me... whose scores were in reach. And with that I would find myself starting another run; then another; then once more. It was addicting, plus the leaderboard format allowed you to come back to SSX after a few weeks and still be able to compete with friends who may have stopped for good. The game also earn bonus points for not incorporating a “pay us to unlock things faster and essentially more useful in multiplayer!” option. Then again this is EA, so there probably was. At least it wasn’t in your face as the runner up.